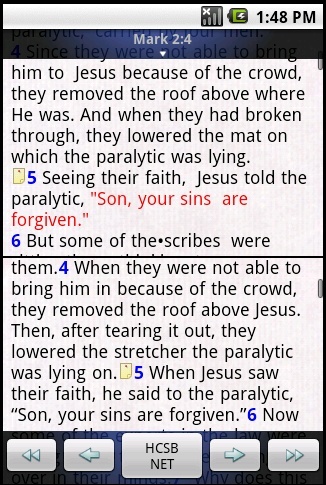 Add bookmarks to jump to specific locations in the Bible, and have a custom name for each bookmark. Add folders to organize your bookmarks into sections. Keyword or phrase search to find specific words in the Bible, filter on current book, OT or NT. Settings screen inside BibleScope includes background, font, font size, colors and many more options to customize your experience. Once a translation is downloaded initially, no Internet connection is needed. 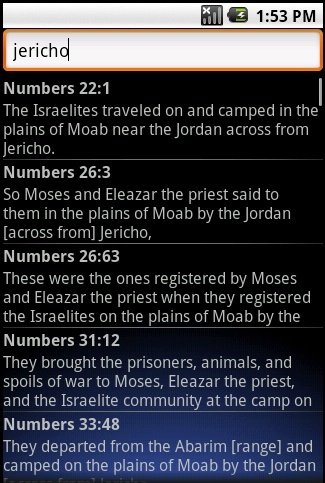 All Bible content is stored locally within the app. Words of Christ in red for the KJV, WEB, NIV, ESV and NASB translations. Many extra Bible translations can be downloaded for free from within BibleScope, and others (NIV, ESV, NASB, NLT, HCSB and others) can be purchased directly from within the app. Bars at the top and bottom slide in/away with a press of the screen. Split-screen display that shows two Bible translations simultaneously. Swipe left/right to go to previous/next chapter. Added the KJV w/ Strongs as an available translation. 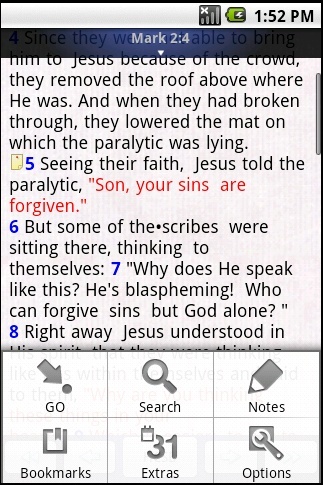 Update BibleScope from the Android market, then go to your translation list in BibleScope and press the Menu button and update the list. 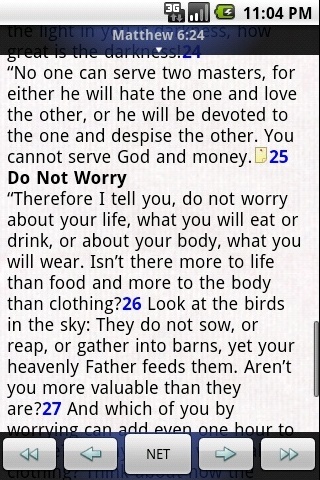 The KJV w/Strongs will be at the bottom of that list.